I have to clear off already to sleeping, this way that dare a short enough description. Time: 1 hour 40 minutes aprox. At all more I saw this image in a fotolog. I erased rose was the image, it was arranged for my, the child, who also was a rose, it changes it to a scale of blue ;) @_@ a child rose cannot be ... and the result was this. Hmm, I dunno too cute to ignore. 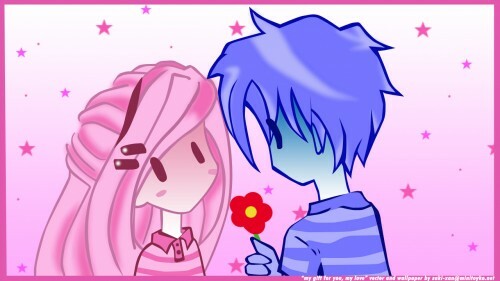 eek cuteness >___< nice chibi style, and I like the hair design on the girl. The colours are cute, except the blue of the boy stands out too much ('cause the background is all pink like her), I would suggest a more purple colour for the background to balance the pink and blue. omg... so kawaii~~! >////< a little too pinky.. just a little... could use purple-ish colour for the background.. but it's awesome.. totally shows the love of the two.. design is nice too.. love the girl's hair..